Get Paid by Autodesk to Test Software! Autodesk is once again looking for people who are familiar with digital creation tools to help us with a new study we will be doing next week (June 21, 22 and 23) in Toronto. To participate in this study, you must be familiar with a 3D CAD or modeling application (such as AutoCAD, Revit, Inventor, Rhino, Modo, Cinema 4D, Blender etc.). If you are regular user of 3ds Max or Maya, you are not eligible for this study. (note: If you have tried 3ds Max or Maya, but then gave up for another solution you can still participate). For this study, you will get to try out a prototype of some new interfaces in 3ds Max while we watch and ask you questions. The sessions will take no more than 1 hour, and you will be paid for your participation. (Payment is $50 in the form of a gift card from a choice of major retailers.) We will ask you to come into our office (at King and Sherbourne) sometime between 9am – 5pm. If you are interested in participating, please reply to this email with answers to the following questions. We will contact you to book a mutually convenient time for you to come in. What is the primary 3D application you use? Have you ever done any rendering? If so, what application did you use? Have you ever tried 3ds Max? Thanks to the 62 people (and 1 robot) who attended and participated in our meeting. 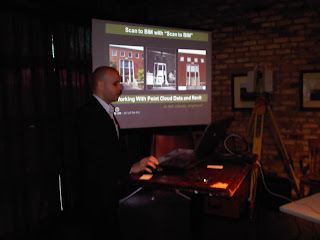 Our two main topics were 'what's new in Revit 2012' and point clouds. Solidcad now sponsoring. Committed to advancing BIM. GORUG meets at Hard Rock Café every 3-4 months with avg.40 attendance. Revit Architecture: Jay Polding of Solidcad ran through the new features. Revit Structure: Rita Wong from Entuitive and Bushra Aboelezz from Halcrow Yolles did a great job to showcase some of what's new (and useful). This time, we didn't have a speaker to get in depth with Revit MEP. This will change by the next meeting as we have had lots of interest from RevitMEPers who would like to help. 7:40 A Real Live Scanner! Les Orford, Applied Precision Inc. and Tom Schoenhofer of Triatic Imaging scanned the room in a few minutes. Then we brought it into Revit. Simple as that. This video shows the results in Revit..
8: 30 Scan to BIM with "Scan to BIM": Andre Carvalho, b i m s o l u t i o n s inc.
Andre showed us how he has used point clouds to model buildings in Revit in the past. He also showed us some of the tools that can be used from the 'Scan to BIM' software.